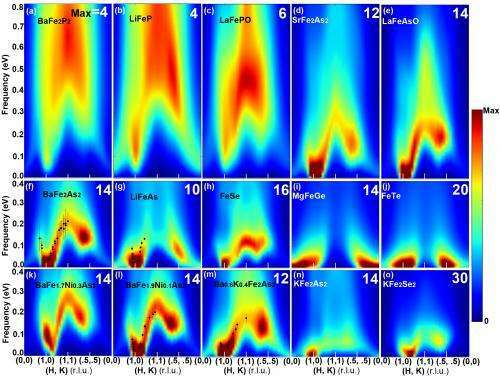 The 15 boxes in this image show the simulated intensity of spin excitations in 15 iron-based materials, including iron compounds that are high-temperature superconductors (images d–h). The x axis shows the momentum of the spin excitation in selected locations of 3D space, and the y axis shows the energy measured in electron volts (eV). The color code indicates the intensity of spin excitations with a given energy and momentum, which is compared with available experimental results (shown in black bars in images f, g, l, and m). The locations with the greatest number of spin excitations are shown in red with decreasing frequency shown from orange to blue. By visualizing the spin dynamics of multiple iron-based materials—information that can be time-consuming and expensive to collect experimentally—researchers can better predict which materials are likely to be superconducting. (Phys.org) —Researchers studying iron-based superconductors are combining novel electronic structure algorithms with the high-performance computing power of the Department of Energy's Titan supercomputer at Oak Ridge National Laboratory to predict spin dynamics, or the ways electrons orient and correlate their spins in a material. Because researchers have suggested that spin dynamics create the conditions needed for superconductivity, this approach could expedite the search for new or modified materials that conduct electricity with little or no resistance at higher temperatures, unlike current commercial superconductors, which must be expensively cooled to exhibit superconducting properties. "Our computational results are in good agreement with experimental results for experiments that have been performed, and we have several predictions for compounds that have not yet been measured," Kotliar said. "Once we validate the theory that our computational models are based on with experiments, then we can investigate materials computationally that are not being studied experimentally." "By comparing simulations and experiments, we learned about which type of spin fluctuations actually promote superconductivity and which ones do not," Kotliar said. "We find these complex problems, as in superconductors, where you have to solve many degrees of freedom or a large number of variables, require supercomputing rather than computing on smaller clusters," Haule said. "Our algorithms are designed to work very efficiently on Titan's massively parallel architecture." "Using computation as a substitute for experiment is an important step forward for designing new materials," Kotliar said. "The next time someone comes to us with potential materials for an application and asks, 'Should I work on this?' we hope to simulate that material through computation to select the most promising ones."